North Carolina is surely becoming swampland with all this rain. It’s really not good for morale – however, this weekend I didn’t let it get in the way of my cooking plans. Thanks to the encouragement of the North Carolina Pork Council, I embarked on a rib making adventure on Sunday. In attempt to make them seasonal, I made a spicy peach and sriracha BBQ sauce that has plenty of vinegar and tang. Additionally, roasting the ribs with a whole cinnamon stick and slices of ginger gives your rainy day Sunday a nice aroma. Instead of grilling this bad guys, I had to broil because of the downpour. It was worth my time as they were almost as good as the smoky real thing. I recommend doing this on a beautiful day when you can grill – but don’t let the rain get in the way of a delicious culinary adventure – especially with ribs. This peach and sriacha sauce would be good on any grilled meats – pork tenderloin, chops or even poultry. 1. The day before, remove the silver skin from the rack of ribs. Mix together the dry ingredients and rub all over the ribs. Refrigerate overnight. 2. The next day, about 3 hours before you want to serve, layer in a roasting pan – onion, cinnamon, ginger and cider vinegar. Place the ribs on top and cover tightly with foil. Braise for 2 hours – or until meat is fork tender – at 325 degrees. 3. While the meat is roasting, in a saucepan, sauté onion and garlic in olive oil until translucent. Add water, vinegar, Worcestershire sauce, orange juice, brown sugar, Sriracha and salt. On medium heat, cook until reduced for about 10 minutes. Add peaches, cover the pan, and simmer for another 15 minutes or until peaches are soft. Move the mixture to a food processor and puree. 4. 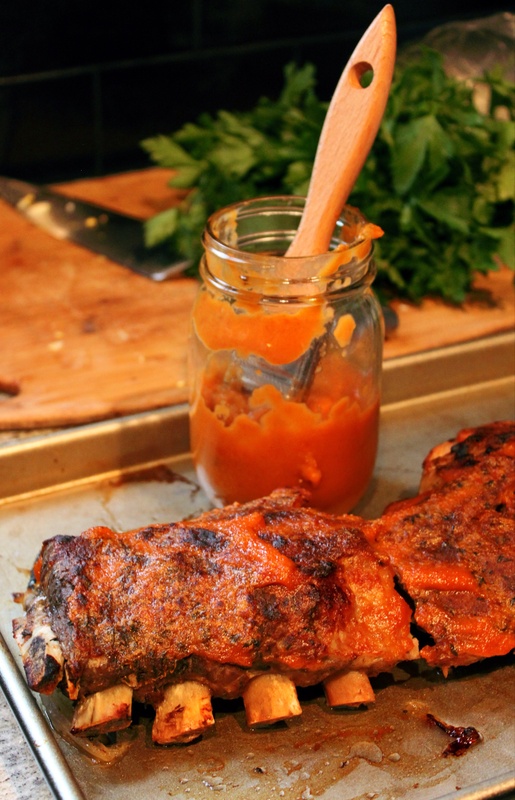 Once the ribs are tender, slather them with the peach BBQ sauce and grill. Or, broil if it’s raining. Serve with additional sauce – because it’s that delicious. This post is sponsored by the NC Pork Council.